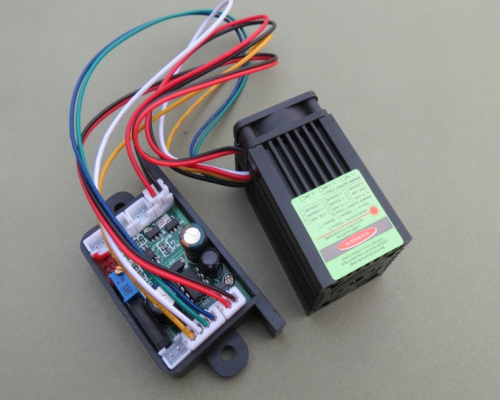 Although this laser module's output power is only 100mw, it is even brighter than some 200mw laser pointers.The laser can work continuously, with Air Cooled. Reverse polarity protection,with automatic identification of positive and negative. Attention: If the input voltage is over 12V, the moudulation will be damaged immediately. TTL stands for Transistor-transistor logic . TTL input is a form of modulation, as opposed to analog modulation. If you apply 5V signal to TTL input, laser turns on. You turn the input off, laser goes off. TTL modulation indicates that the laser does not support analog modulation of the output but only ON / OFF control. See blanking. With an RGB laser and TTL blanking you have seven colours at your disposal. Red, Green, Blue, Cyan, Magenta, Yellow, White.